Our Women’s Heart Alliance was proud to be part of this. By Robert Pear – The New York Times. WASHINGTON — With self-congratulatory zeal and smiles all around, huge bipartisan majorities in Congress have just passed legislation to speed the discovery of cures for killer diseases. At the same time, Republican leaders have been devising a strategy to undo the Affordable Care Act, which has done more than any law in a generation to treat people with those diseases. “It is a real contradiction,” said Dr. Otis W. Brawley, the chief medical officer at the American Cancer Society. In recent years, few major bills have commanded as much support as the 21st Century Cures Act, which sailed to passage by votes of 392 to 26 in the House on Nov. 30, and 94 to 5 in the Senate a week later. Once it is signed by President Obama on Tuesday, as the White House has said it will be, the law will allow for money to be pumped into biomedical research and speed the approval of new drugs and medical devices. It also includes provisions to improve mental health care and combat opioid abuse. Ellen V. Sigal, the chairwoman of Friends of Cancer Research, an advocacy group, said “there’s a disconnect” between efforts to pass the Cures Act and to repeal the Affordable Care Act. Lawmakers have their own explanations. For one thing, the two health care efforts vastly differ in size. At a cost of $6.3 billion, the Cures Act is not small, but the Affordable Care Act cost hundreds of billions of dollars and affected every facet of medicine — from insurance coverage to delivery of care. It was bound to be more difficult to enact. 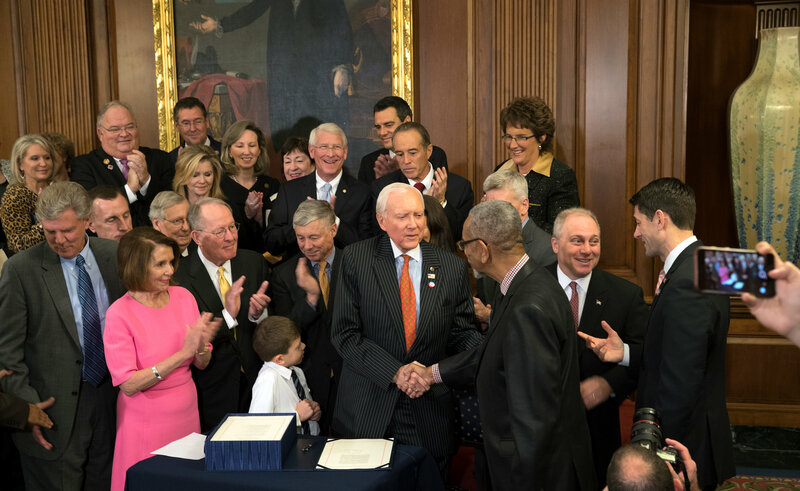 The Republican authors of the Cures Act — Representative Fred Upton of Michigan and Senator Lamar Alexander of Tennessee — went to great lengths to work closely with Democrats, led by Representative Diana DeGette of Colorado and Senator Patty Murray of Washington. The cooperation paid off. “We had bipartisan buy-in from Day 1,” Ms. DeGette said. By contrast, the Affordable Care Act was adopted in 2010 without a single Republican vote — either because, as Democrats have said, Republicans refused to cooperate; or, as Republicans have said, because it was jammed down their throats. “We have been like the Hatfields and McCoys ever since, shooting each other,” Mr. Alexander said. The American Cancer Society supported both the Affordable Care Act and the current biomedical research bill, and sees the two efforts as intertwined. The surge in spending on medical research will almost surely lead to new treatments, which could include some extraordinarily expensive drug therapies. To get such treatments, patients would need to have not just insurance, but good insurance coverage. (Some drug companies offer prescription assistance programs to help defray the costs.) A repeal of the Affordable Care Act could leave millions without access to the benefits of the biomedical research bill, Democrats have said. Another factor in passage of the Cures Act was the relentless advocacy of Dr. Francis S. Collins, director of the National Institutes of Health, who helped lawmakers appreciate the possibility of a golden age of medicine — with an artificial pancreas for diabetics, a vaccine for AIDS and the use of stem cells to repair damaged heart tissue. Even as Congress wrapped up approval of the Cures Act this week, Republicans were having serious discussions about how to repeal and replace the Affordable Care Act without interrupting coverage for the newly insured. Republicans say they feel an obligation to move fast, because the law is crushing many families and small businesses with high costs. The Cures Act would also increase access to mental health care, which has been a bipartisan goal since the fatal shootings in 2012 of 20 children and six adults at Sandy Hook Elementary School in Newtown, Conn.
Sponsors of the Cures Act toured the country, visited clinics, held hearings and listened to patients who recounted their struggles with cancer, Alzheimer’s and dozens of other diseases. Patients and their well-organized advocacy groups proved to be more effective than the uninsured in lobbying Congress. In debates on the Affordable Care Act, lawmakers have continually fought over the proper role of the federal government. Republicans see the need for a federal role in conducting research and regulating drugs, but not in regulating the details of health insurance. Under the 2010 law, they have said, the Obama administration has issued so many regulations, bulletins, official policy statements and informal “guidance documents” that not even federal officials can keep track of them all. Democrats have said the federal standards are needed to guarantee universal access to “essential health benefits,” and to prevent insurers from discriminating against those who are sick.